I remember watching an MTV special in the late 90’s, ya know just as they were killing music videos, about how much money a top-10 pop song’s video cost to make. I then remember thinking about the overwhelming price tag and how small artists are virtually shut out of the ability to make a good video. Not that it matters within the next 5 years MTV had all but made music videos a thing of the past on their flagship brand and launched MTV2 where videos also suffered a horrendous death to reality t.v. Then came ebaumsworld, and eventually YouTube and now their partnership brand “Vevo” which showcases many of the top artists music videos and a handful of lesser known artists as well. The partnership has garnered huge success, in terms of views, by top artists with mega-budget videos such as Beyonce’s “Run the World” now at over 73 million views. So here we are, the most advanced society ever to inhabit the earth and yet johnny guitarist still has to resort to making videos on his webcam and hope that his bland white wall bedroom is the perfect backdrop to showcase his talents to viewers. Most of the time it’s not. That brings me to the point of this letter, Alternative Music Videos. An alternative music video is one created outside of the control of the artist, producer, label or anyone set to directly benefit from the sale of the artists music. There are thousands of adoring fans that constantly make these videos to help spread the love of their favorite artists and songs. Unfortunately, just like in 1999, the industry more or less rails against these creative outlets and has videos constantly removed from websites in order to “protect their copyright” but what’s the difference? If you are allowing a video of your music to be online then why complain when a fan makes a video using video game footage (called game music videos), still images, motion graphics, karaoke scenes, sports footage or anything else they come up with? Are you scared that your $250,000 video will get shown up online? Indie artists, for you this should be a no brainer. Encouraging your fans to spread your music can land you a record deal, or if you’re not the selling out type it could land you many more listeners and more importantly higher sales. Blink 182 and Tech N9ne seem to be the only artists on the planet that get it. Tech N9ne has had a long standing ideology of allowing his fans to do what they want with his music, even swap it on P2P networks and that seems to be working for the veteran rapper as he is a sought after concert still today. That philosophy has seen his fans make their own versions of videos for tracks like his “Einstein” pushing 4 million views right now. Recently Blink 182 released a music video for their first new single since the band got back together and made the video using clips from videos that fans had made with Blink 182 songs and uploaded to the internet. In 12 days that video has gotten 275,000 views, an audio only version uploaded a month ago has gotten 1.6 million views in 31 days. The fan video is averaging about 23,000 views per day while the older and first video with only audio averages around 55,000 views per day. I can’t tell you if the same viewers watched each, or if people (like me) only heard of the second video because of the news around it, but it shows some demand for user generated videos. Consumers today are sharing their likes and dislikes with similar minded consumers in much richer and fuller ways, such as fan artwork, fan videos and other things. Your options are only to utilize these new avenues and encourage your fans to share or to abandon them. musician should be credited with name and track name in the video and in any text description accompanying the video. With all of that said GamersTube will begin sending out a monthly(ish) Game Music Video newsletter to inform GMV creators of bands/artists that are looking for or are open to an alternate music video to be created for a track. 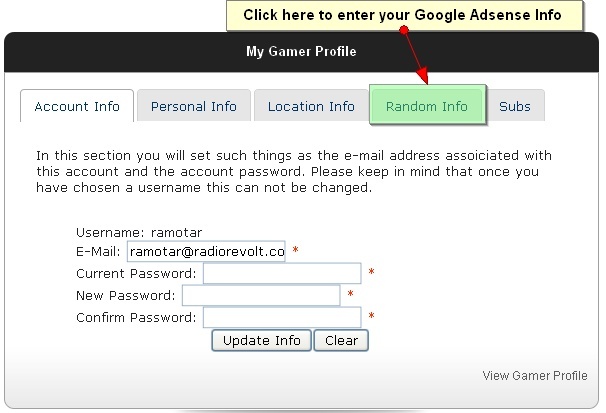 Just supply us the credentials required (artist, label, song, album, genre) and we’ll send it out to our over 20,000 registered users. Do you enjoy making videos? or maybe you have access to some great game trailers? Can’t seem to break the 1 million view on YouTube or maybe they just aren’t inviting you to be a partner? 4. HOLY PAC-MAN!! That was EASY. 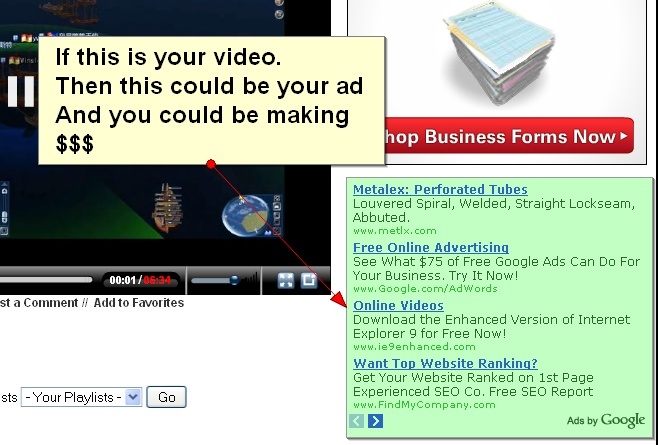 Now your all set to start making $$ every time your video is viewed. Google deleted our blog on Blogger / Blogspot without warning and claimed it was a ‘spam’ blog. Oddly enough this was immediately after we launched Revenue Giving 2.0, a program for gamers / video producers to earn money directly on our website. After several complaints and even a twitter discussion with Matt Cutts that ended after he didnt reply for weeks we decided to simply start the blog over and are examining whether or not it’s necessary to file an official complaint with the FTC for what appears to be blatant anti-competitive practices. With all of that said welcome to the new “Loading” blog, our official communication channel.